Establishing shot of Lawndale High School, in a scene from Is It Fall Yet?. In earlier seasons, the drop-off lane has speed bumps. Lawndale High is a fictional location featured regularly in MTV's animated series Daria. The high school, located in the suburban town of Lawndale, was the learning/teaching place for most of the show's primary characters and the setting of many stories. Little information was ever given in the series about the history of or educational programs of the school, but it is certain that the subjects English, History, Art, Science, Physical Education, and Economics were taught there in some form, as well as a special self-esteem class for sufferers of a lack thereof. The football team is the Lawndale Lions, who are given extreme importance by the faculty. Their main rival is Oakwood High School's Oakwood Taproots. Under Principal Li, the school's security is absurdly over the top, complete with bomb-sniffer dogs, bulletproof skylights over the swimming pool, and regular urine tests. As shown on LHS letterhead featured in The Daria Database, the school motto is "High Security for High Performance". A Parent-Teacher Association is known to exist, as per "See Jane Run". Unfortunately, that same episode revealed the PTA were aware of grade-fixing for sports team members (and even of blackmail threats made to keep Jane Lane competing). There is an annual Dian Fossey Award for graduating students who had high academic achievement. 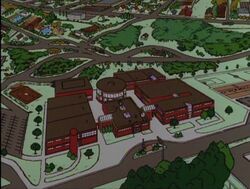 The Lawndale High School campus, as seen in Daria! Now-extinct webpages once found on MTV's Daria site offered information on the high school's origins and internal workings. One was the main page to the Lawndale High School Web Page (c. 2001), which revealed the following tongue-in-cheek info. Lawndale High School is a public co-educational high school set amongst the rolling hills and flatter surfaces of Carter County. Lawndale is an attractive suburban community conveniently located within driving distance of two airports, four malls, and 27 mini-malls. Lawndale is also home to the soon-to-be-landmarked Big Strawberry. LHS has a diverse student body of 1400, with an ethnic balance reflecting Lawndale's proud tradition of multiculturalism (we'd rather not give hard numbers). Many of our students go on to higher education, and of the ones who don't, the vast majority manage to stay out of prison. Our accomplished athletes, extracurricular activities, and high academic standards assure Lawndale High School's reputation as "The Swarthmore of Regional School District 8." * To join the Save the Strawberry campaign, see Mr. O'Neill. He says someone at the National Register of Historic Places finally returned one of his phone calls. The school first had a website in 1994, made by student Todd K. Feichmann. "It consisted of his resume and a 3000-word essay on mutant battle psychology as encountered in the first six levels of DOOM". After he graduated, the website was passed on to members of the Computer Club, and in 1999 Jodie Landon and Michael Mackenzie took over and redrafted the site. Around 2001, Angela Li created (and announced on the website) the Track-Tastic system, "which comprehensively cross-references confidential student information, local law-enforcement files, and multiple consumer-spending databases, all while continuously monitoring e-Bay for stun-gun auctions". For some reason (likely to create dramatic tension), Lawndale High was subject to an extraordinary number of calamities while Daria was there, and even before. Perhaps it was built over an ancient Indian burial ground and was thus cursed. We see five extra teachers in "Lucky Strike": a tall black man in a blue suit, a pudgy black man with glasses, a brunette woman in a yellow blouse, a bald man with a large brown beard, and a skinny, seemingly middle-aged woman with short, spiky blonde hair. We're not told their names or the classes they teach. For a school the size of Lawndale, this is an oddly low number of teachers and they seem to teach every class in their chosen subjects (and far too many in O'Neill's case). In real life, this is because the writers wanted to use the same characters throughout the show; in-universe, we can almost certainly blame Li's budgeting. 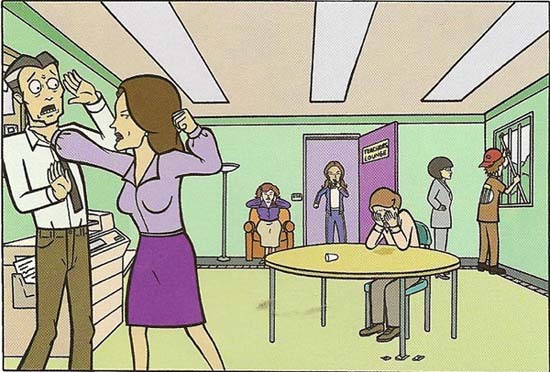 The Daria Diaries and "Quinn the Brain" mention a school janitor or custodian (named Pavlov, or something like that), and several janitors are shown in "The Misery Chick." Security guards are also mentioned in The Daria Diaries. The school nurse, Nurse Chase, is mentioned in "Ill". The year before Daria came to school, a large number of the senior class went to Ivy League colleges - because they hacked the school's records and changed them. Li notes in "The Daria Diaries" that "I am happy to say most of the offending students have been discovered and are back with us this year to complete remedial math." * Were never given surnames on the series. ** Were already ex-students of Lawndale High by the beginning of the series. *** Were never given first names on the series. In addition to academia, there are a number of other activities, including sports, in which the students of Lawndale High can engage. They are referenced to in the TV episodes and in the two Daria books (The Daria Diaries and The Daria Database). Extracurricular activities mentioned in canon are listed below with the sources of information on them. Sports is considered of high importance, and corruption is rife: students in the important sports clubs and teams have their grades fixed so they can keep playing ("See Jane Run", "Murder, She Snored") and this is known to their parents and the PTA ("See Jane Run", "Mart of Darkness"). Angela Li explicitly puts the football team ahead of academics. Sports not mentioned in canon, so far as can be told, include: baseball, cross-country, golf, gymnastics, ice hockey, softball. Roller hockey was shown in "The Big House," but it was a specialty sport played only by faculty competing against local disk jockeys, as a school fund-raising event. Swimming is not mentioned, but Lawndale High has a pool ("This Year's Model"). There is an actual school in Lawndale, California, U.S.A., called Lawndale High School. No deliberate or accidental resemblance to the cartoon-show school is evident. The security of Lawndale High is often bumped up for fanfics, far beyond what we saw in canon. This can either be serious or played for laughs - it reached a climax in Scarlett the Dark Fairy Meets the Crossed (from Hell is Crossed People Iron Chef), where the school is built structurally strong enough to withstand a one-half kiloton nuclear detonation. In a more serious take, "But in Her Heart a Cold December" by The Angst Guy reveals that Li's security build-up is due to a fear of North Korean agents finding her. The school is destroyed (on orders by John Dynell) in Legion of Lawndale Heroes but is rebuilt with a greater security focus: now secure enough to survive a near-hit from a five-megaton nuclear detonation, or several repeated strikes from a Class Five metahuman. This page was last edited on 6 April 2018, at 00:59.